These White Chocolate Peanut Butter Kettle Corn Clusters are the perfect blend of sweet and salty – the perfect holiday treat! I have a super quick and easy holiday recipe for you today! I am excited to share this, because it’s super yummy, but also only takes a few minutes to make, and everyone will love it! These White Chocolate Peanut Butter Kettle Corn Clusters are the perfect blend of sweet and salty – the perfect holiday treat! Check out this easy How-to video above! 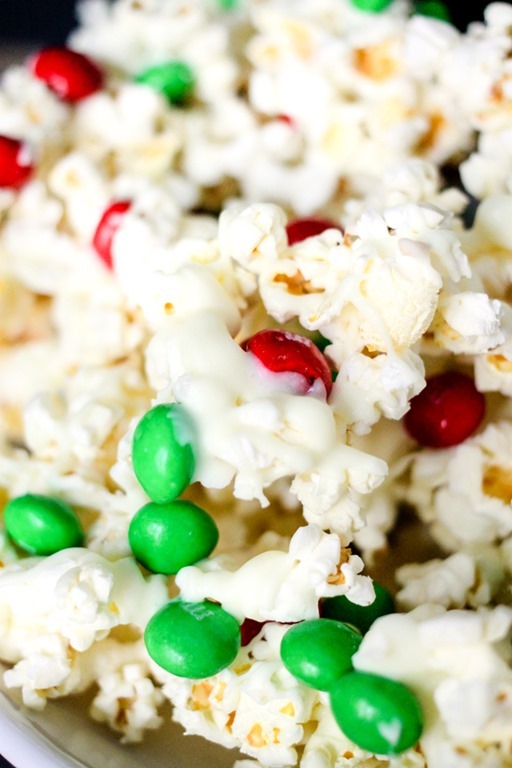 Like I said, this recipe is super simple, you only need 3 ingredients – popcorn, white chocolate, and peanut butter M&M’s. 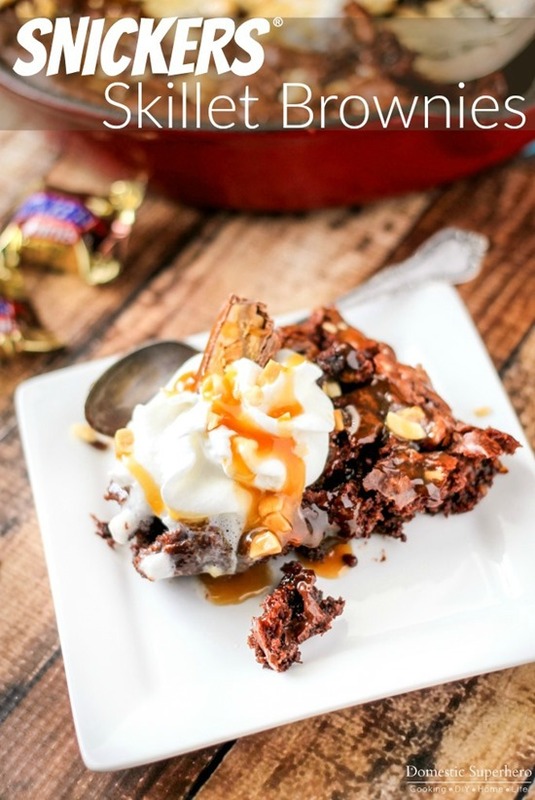 If you don’t like peanut butter or have allergies, you could make this with regular chocolate M&M’s! First, pop a couple bags of kettle corn and then melt your white chocolate. Next you’ll spread the popcorn out, and then drizzle the white chocolate all over the top, you want it covered! Then sprinkle your peanut butter M&M’s all around. 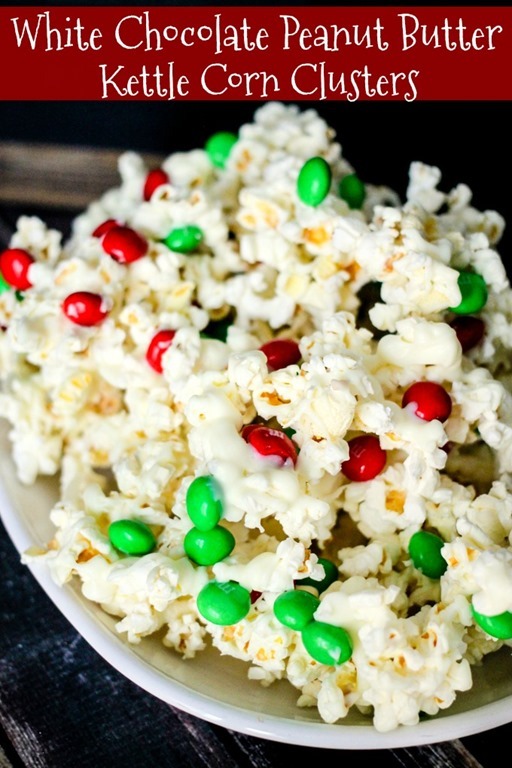 Pop this into the fridge for about an hour and the chocolate will harden, making the popcorn and M&M’s stick together! As you can see, I used the holiday color M&M’s, but you could use any kind and then make this all year round! 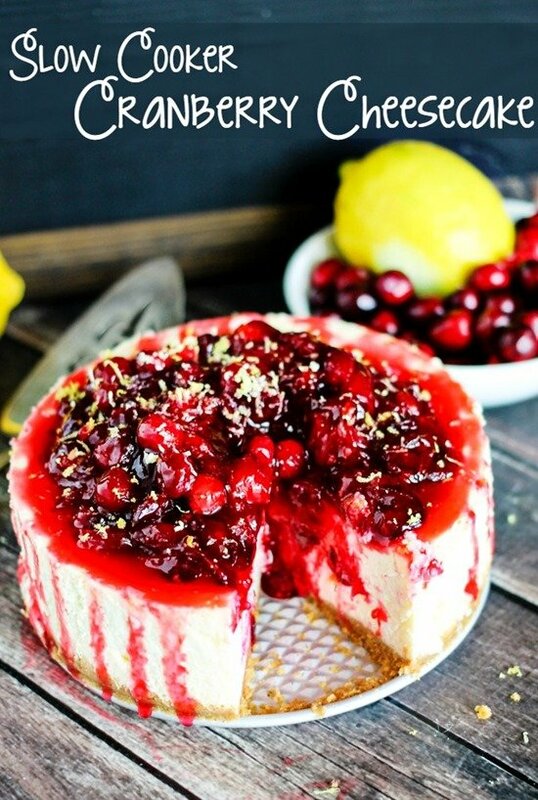 Heck, I would eat this year round with the holiday colors…it’s SO good! Once everything hardens up, all you do it break it into pieces, so easy! 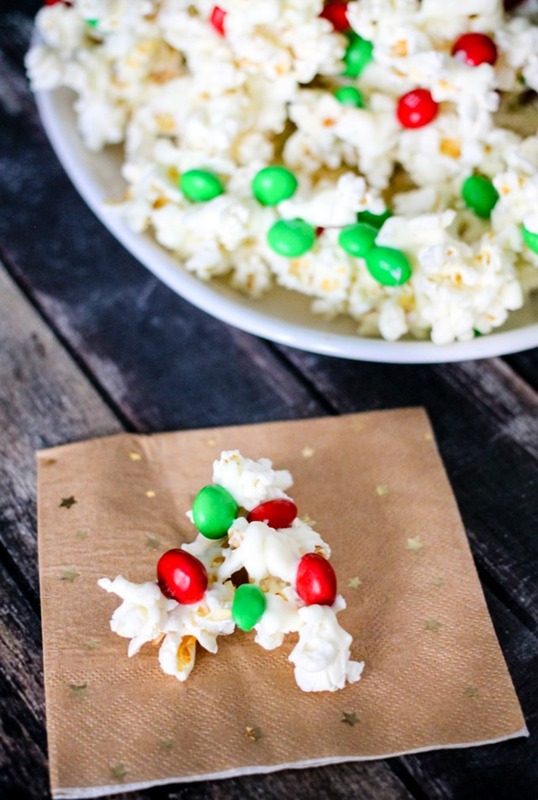 These White Chocolate Peanut Butter Kettle Corn Clusters are sure to be one of your favorite holiday snacks! Try them out at your next party and see what everyone thinks; I bet everyone will be begging you for the recipe! 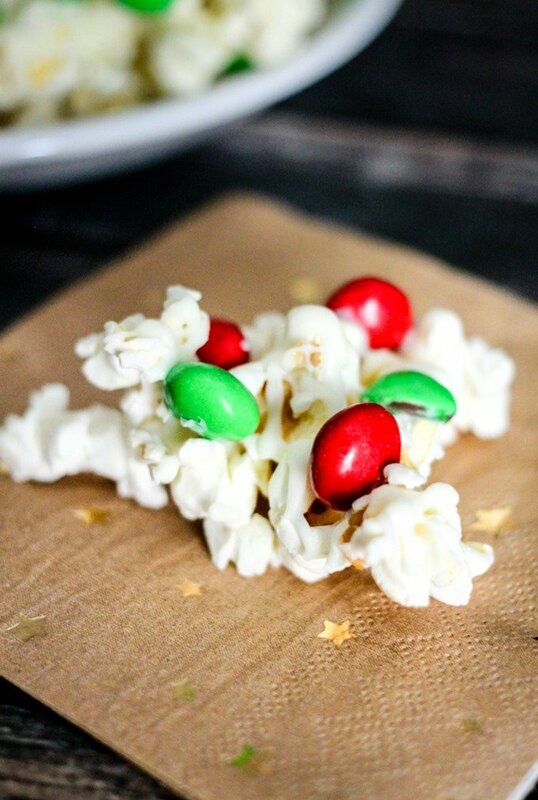 On a large sheet of parchment paper, spread out popped popcorn. 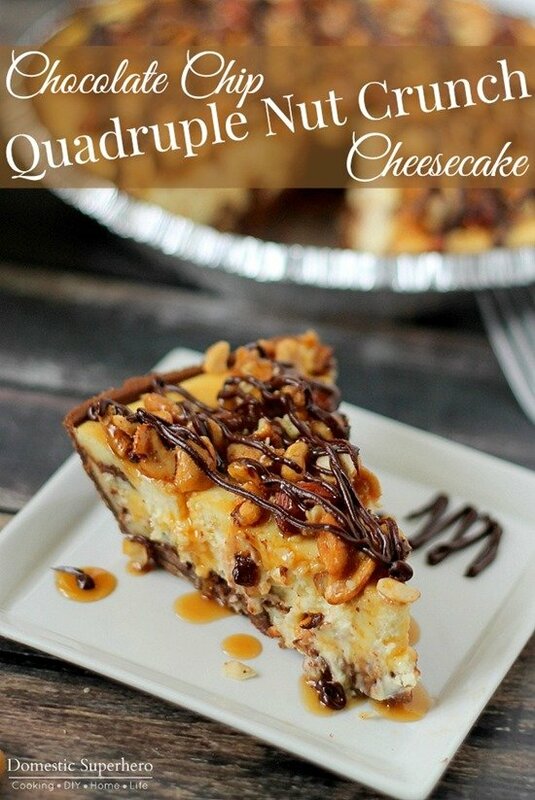 Drizzle melted white chocolate all over the top. Sprinkle M&M’s over the top lightly pressing into the chocolate. Slide parchment onto a baking sheet, and put into the fridge for at least one hour. Slide parchment onto a baking sheet, and put into the fridge for at least one hour. Heat it on medium high for about 1 minute to start with. Remove from the microwave and stir. Repeat heating at shorter intervals, 15 to 20 seconds, stirring in between, until the chocolate is completely melted and has a smooth consistency.